Motorcycle chain cleaning is an essential maintenance procedure on all chain-driven bikes. 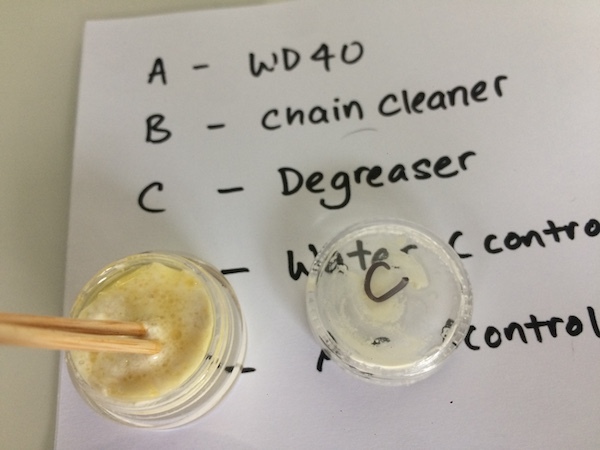 While everybody have their favorite chain cleaner, the topic of the suitability of WD-40 as a chain cleaner (and as a chain lube) is amongst the most controversial ones in chain maintenance chats. Some swear by it, while others swear at it. The biggest concern motorcycle owners have on the choice of cleaning fluids on their o-ring (or x-ring, or z-ring) sealed chain is the effect of the fluid on the o-ring itself. The 0-rings serve as a seal that locks lubricating grease between the pin and the roller of the chain, significantly increase the chain’s useful life as compared to non-o-ring chains. Any deterioration of this rubber o-ring will allow grease to escape and contaminants such as dirt, mud and other yucky stuff into the tiny crevices inside the chain, leading to a drastically reduced chain life. Still not convinced? Kiethm (nick: klm4755) also ran his pretty comprehensive home experiment on the effects of WD-40 (amongst other liquids) on chain o-rings, and posted it on advrider.com. Do check out his amazing effort there! 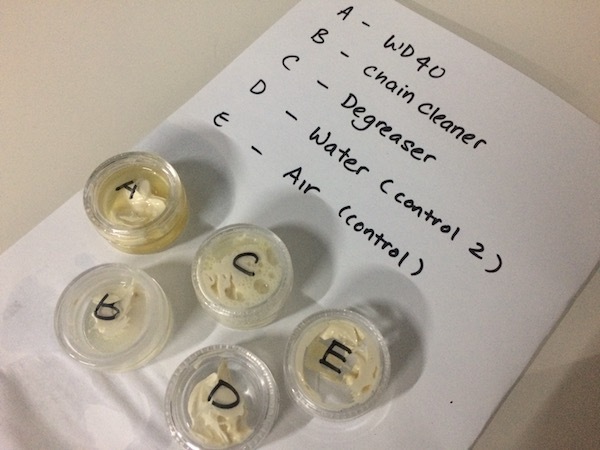 Keithm’s experiment on the effects of various fluids on rubber o-rings. Not bad, WD-40! You’re doing well! 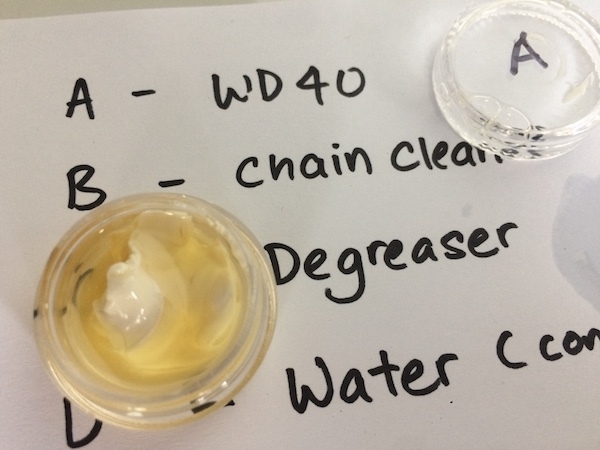 And although WD-40 has been demonstrated to not affect rubber o-rings in the experiments above, some are still (rightfully) skeptical if it has any effects on the grease within the chain. Screenshot of one of the comments left on Keithm’s experiment. You see, WD-40 was designed as a water-displacement fluid. It is also a great penetrating fluid and it is reasonably concerning that if the WD-40 gets past the o-rings, what then are its effects on the grease within? Will it dissolve grease and thus dry out the inside of the chain? And so I set out to perform a little experiment of my own. 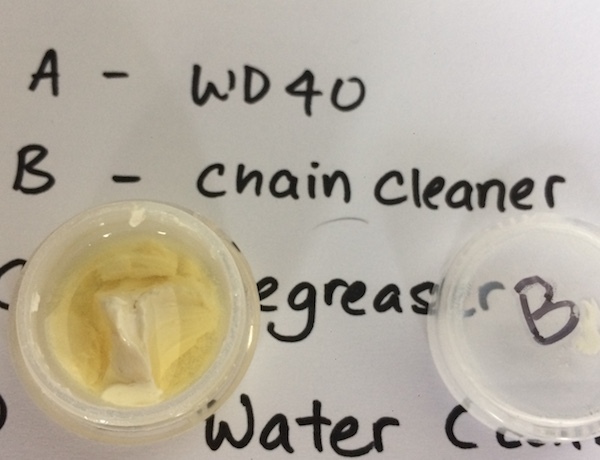 Now, I have to say that this is in NO WAY near completely scientific, but the goal was to convince MYSELF if WD-40 is safe for use on an o-ring motorcycle chain with sealed grease. So I mimicked Keithm’s experiement – but this time, with GREASE instead of o-rings. 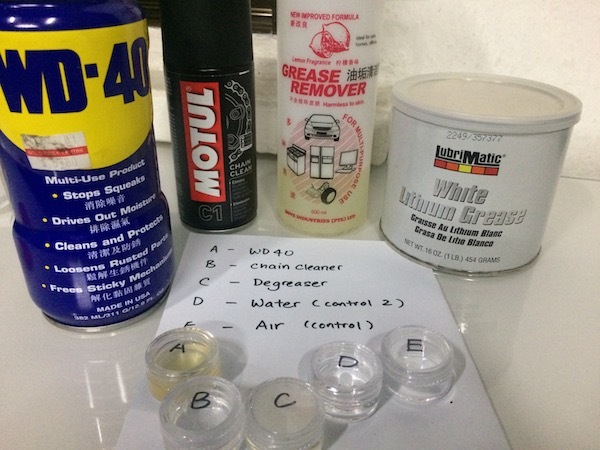 My little experiment station – WD-40, a proper chain cleaner, degreaser, water, and air. Add a little bit of white lithium grease. Filling ’em up with grease! And now we wait… Notice how the degreaser is reacting with the blob of grease already? 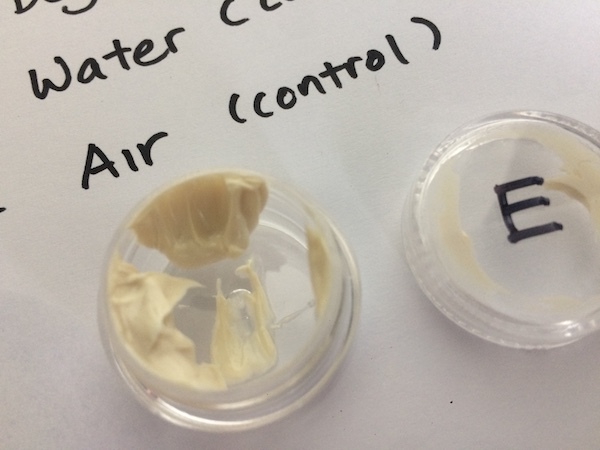 I wasn’t expecting any observable changes to the grease blob soaked in water (D) and air (E). As expected, the grease blob exposed to degreaser (C) rapidly softened and appeared to “dissolve”. 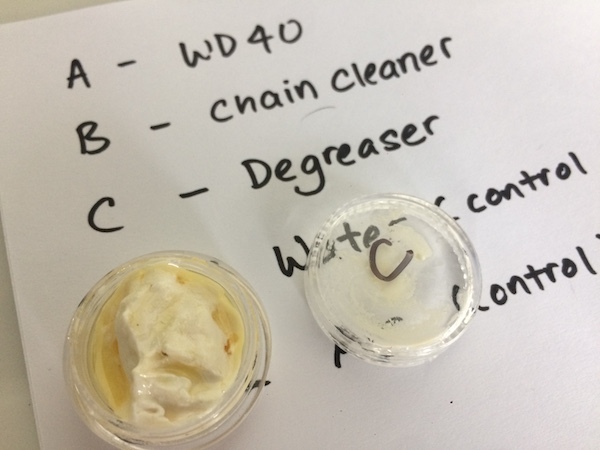 While there was no observable change to the WD-40 (A) mix, I was very surprised to see a very slight reaction the chain cleaner (B) had on the grease blob. I then allowed the solutions to soak for the next 12hrs or so to determine what effects the various fluids have on the grease blob. 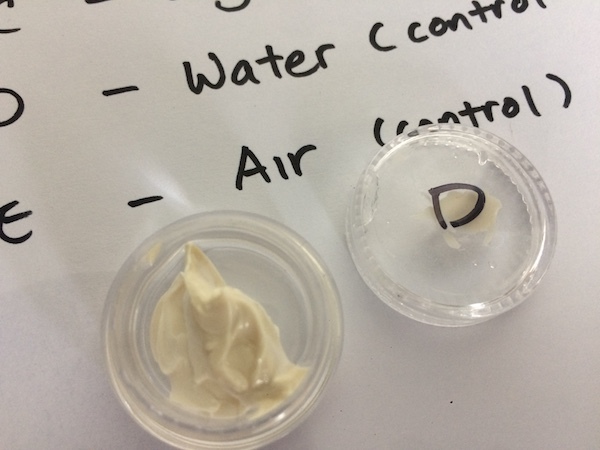 Not surprisingly, no change to the water (D) and air (E) mixture. Exhibit E – grease in air. 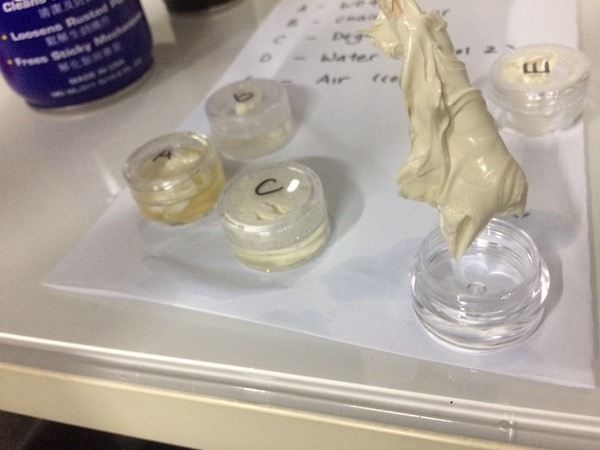 Exhibit D – grease and water. No observable changes. Exhibit C – grease and degreaser. Exhibit C with a little gentle agitation – turns into a liquid mixture readily. And I thought I’d let the video explain the viscosity of the mixture. Exhibit B – grease and chain cleaner. Notice the very slight ‘flaking’ off of the grease blob suspended in the fluid? 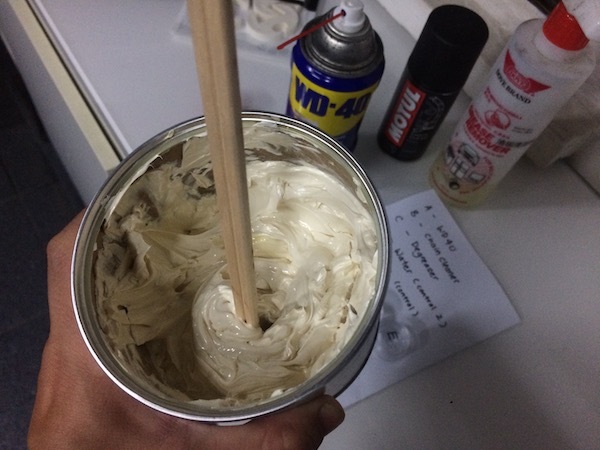 Exhibit A – grease and WD-40. 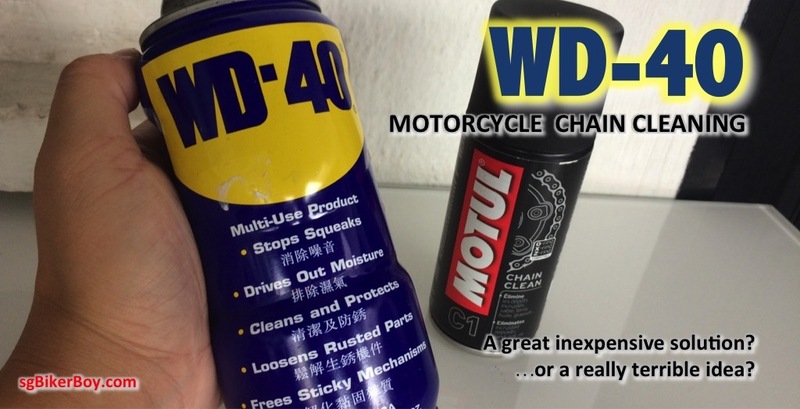 I don’t know about you, but I feel pretty confident using WD-40 as a chain CLEANER. It’s appears to be safe on o-ring chains and grease, and in my experience, does a great job cleaning off gunk too. It probably won’t function as well as a chain LUBE though – but that’s for another day. Of course, if you still feel uncomfortable, there is always the commercial chain cleaners that you can get off the shelves that are specifically designed to clean motorcycle chains. But hey! 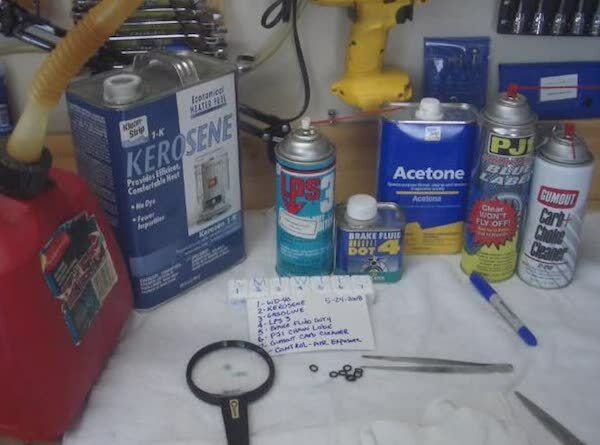 Since there are so many other uses for WD-40 and not just chain cleaning, and at only a few dollars for a large can of WD-40, I know what I’d be keeping in my tools cabinet. 30 km on, seems to work fine. Previous Previous post: Lupromax, really? Why you so scared?